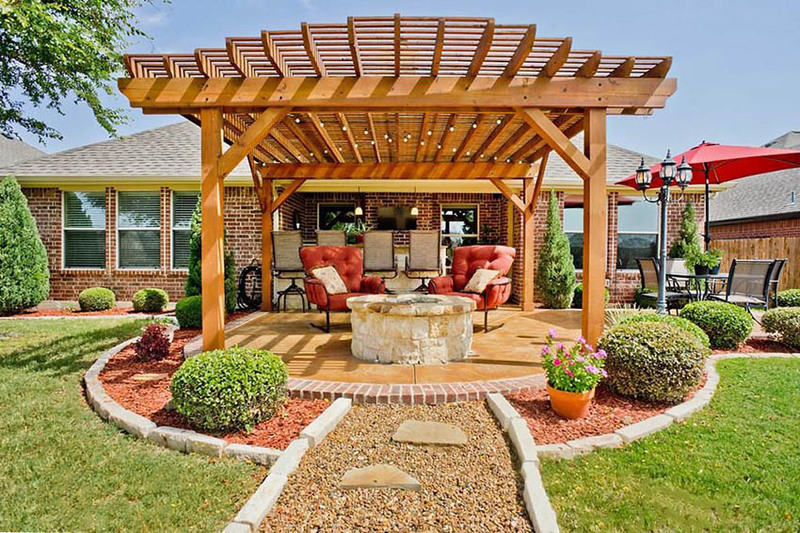 Welcome to our gallery of pergola with fire pit designs for a variety of backyards. Pergolas and fire pits have been known to improve the overall look an ambiance of any patio or garden. The warm illumination and the comfortable heat combined with the added protection and privacy given by the pergola, makes it all the more inviting to use. 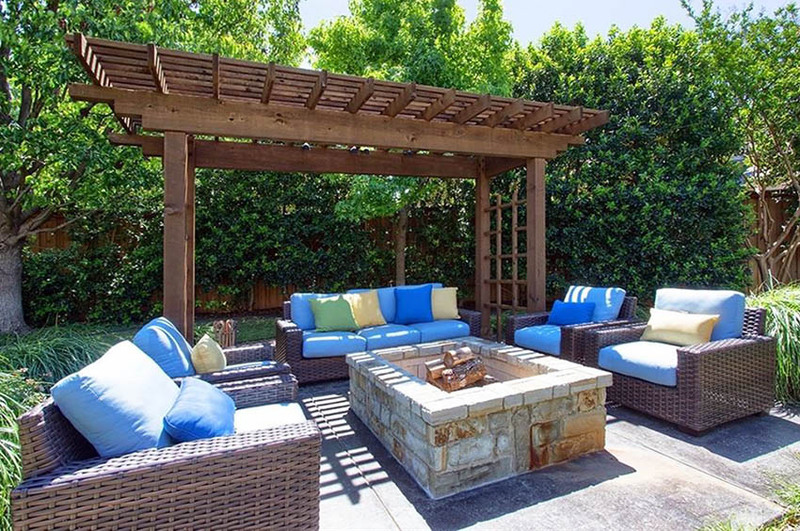 However, if you want to add both features in your patio & garden, most especially if you plan to place a fire pit under a pergola structure, there are a few things you need to consider. 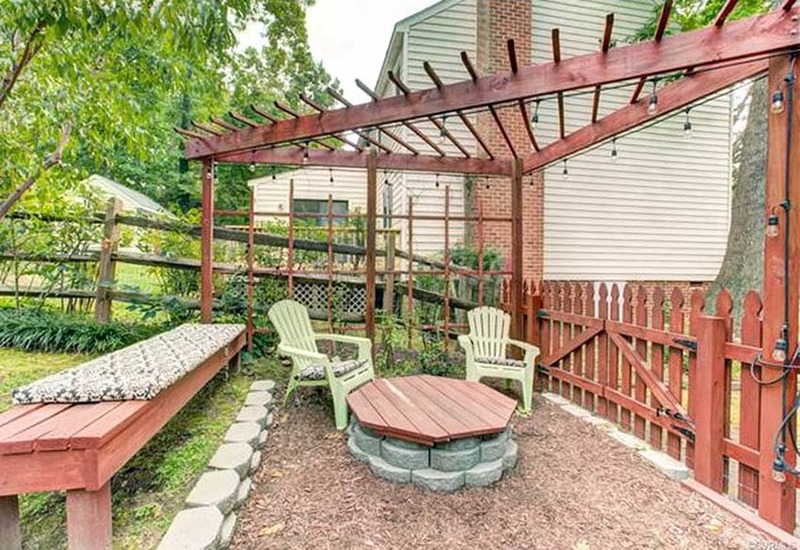 Is a Fire Pit Under a Pergola Safe? 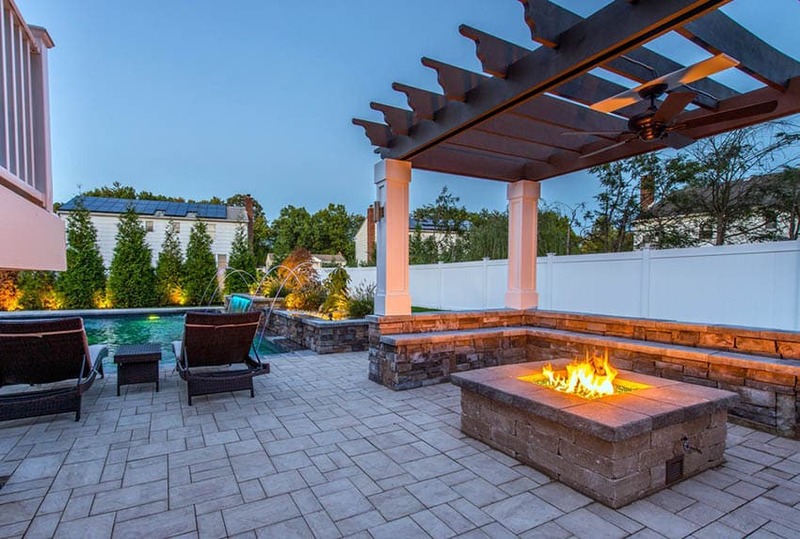 There are many different types of fire pit designs available, and depending on the one you install, a certain minimum clearance between the fire pit surface and the pergola overhead structure must be observed to ensure safety. Gas fire pits utilize a burner over a media such as lava rock, ceramic logs or fire glass to create a beautiful fire. A few of the primary benefits of gas fire pits are they are easy to start, require no cleanup, provide no smokey smell and are safe with a controlled flame. LP fire pit – needs a clearance of 94″. Verify the minimum clearance indicated by supplier. Natural gas fire pit – needs a minimum clearance of 120″. Verify the minimum clearance indicated by supplier. Gas fire tables – These portable fire pits vary in size and design. They typically run 23″, 29″ or 35″ in height. 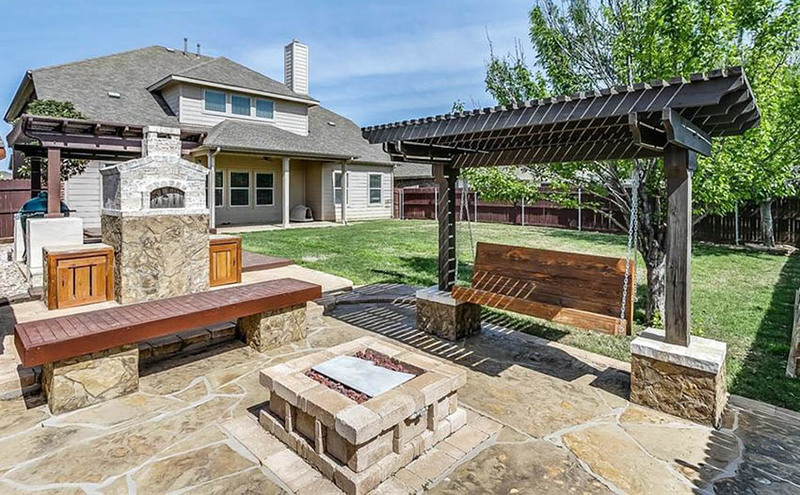 This attached metal pergola uses a portable metal wood-burning fire pit which can also be used for grilling. This is the best choice for cooking purposes as wood-burning grill gives more flavor depth to food cooked on it. Additional string garden lights and lamps were added to further enhance the ambiance of the space. The pergola material and the fire pit burner type are two very important considerations. 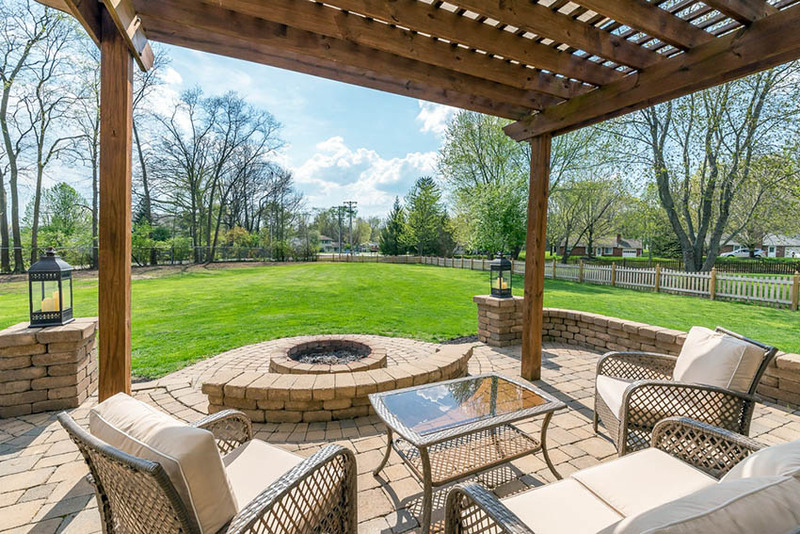 If you are installing a fire pit on an existing pergola structure, make sure that the burner you will purchase and install is safe for the clearance and material of your existing structure. If you’re installing a pergola over an existing gas burner, then check the manufacturing details on the recommended clearances so that you can select the appropriate pergola structure. If both will be newly installed, then you would have a bit more flexibility on your choices. Before beginning any construct you’ll want to consult with your local town ordinances pertaining to fire pits. Some jurisdictions prohibit any structure above a fire pit. Make sure to follow your specific model fire pit’s rules & safety regulations. Make sure you have proper ventilation to avoid exposure to residual heat of excess gas. Propane gas is heavier than air and can become trapped and accumulate creating an unsafe environment. Make sure the ceiling and sides of the pergola structure is far enough away to ensure heat can disperse. Excess heat buildup can cause burns and damage to occur. Make sure you install any fire pit on a level surface. Wood burning fire pits can have flames that are difficult to control. They can also put off harmful smoke and excess heat. For these reasons it is not recommended to use an open fire under any structure. In addition smoke can cause discoloration and cracks to form on nearby structures. As a safety precaution keep a fire extinguisher in reach. Avoid placing a fire pit near any trees with overhanging limbs, falling branches or leaves. Are there any other combustible materials surrounding the fire pit? If so make sure they are far enough away. Never leave a fire pit unattended and do not allow children to play around a fire pit without adult supervision. 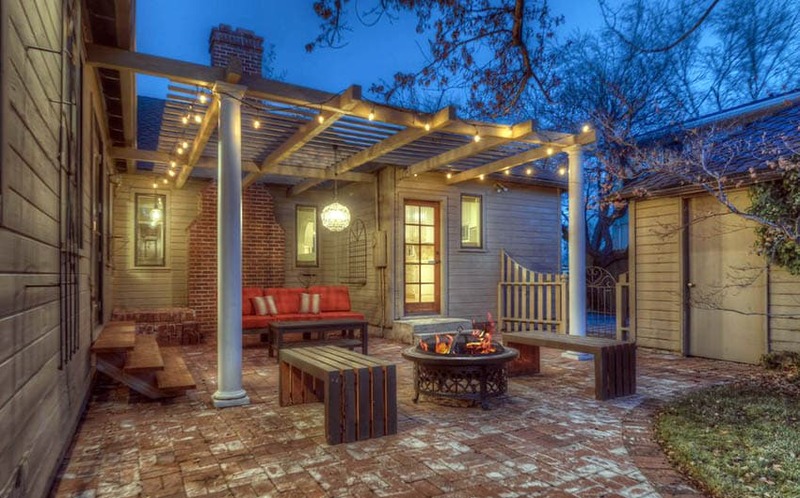 A fire pit under a pergola can make a great feature for your home’s backyard. By taking a little care to ensure your fire pit is installed and used properly you can avoid potential safety hazards and best enjoy it for years to come. This is a small propane stone fire pit placed under a solid wood overhang pergola structure. This is further accentuated by garden string lights to enhance the ambiance of the space. If you’re concerned with safety and you do not want any discoloration or burn marks on your patio structure, this above example is an excellent idea. The brick fire pit was placed outside the overhead solid wood pergola structure, so the natural gas fire pit would less likely burn it. If you don’t have space for a built-in fire pit, or if you prefer a more mobile fire pit, you can opt to use a portable propane fire pit. This example uses a coffee table with a built-in propane fire pit, helping it blend in and making it mobile. 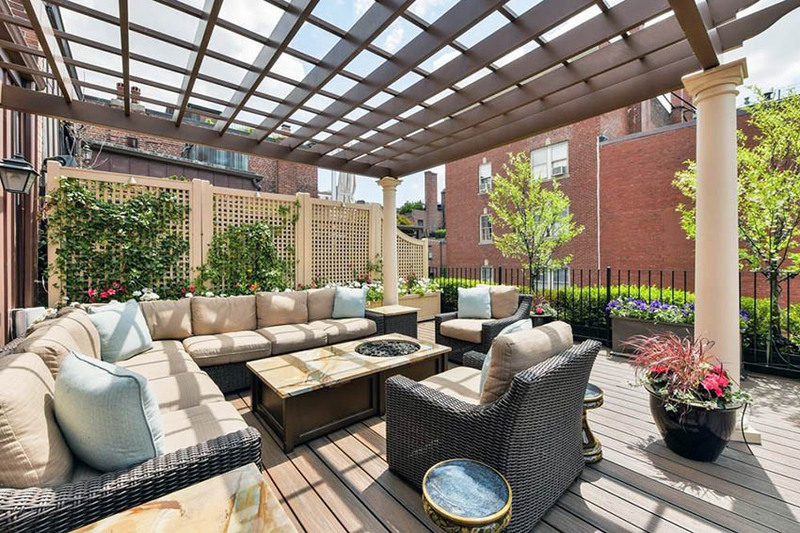 This small corner patio uses a wood fire pit, in which half is directly under the patio structure, and the other half on open air. Since this fire pit is placed under a patio structure with additional plastic and fabric materials, propane was the fire pit of choice as it provides a more controlled fire / heat output, making it safer and easier to adjust. 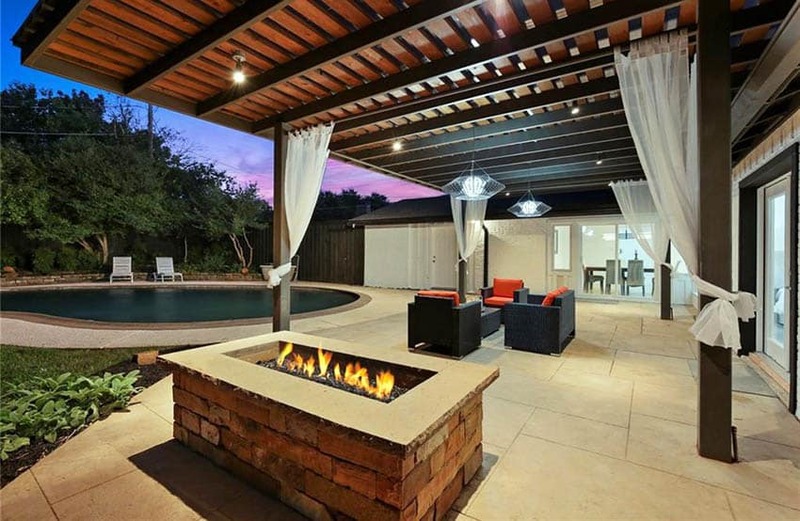 This has fire pit is placed under a wooden pergola overhead structure, which is supported by concrete and stone masonry foundation. Since the fire pit cover and the surrounding built-in bench seat are made of stone and concrete, is safe to place the seat closer to the fire pit. A lightweight wooden pergola structure is attached to the house’s yard to give more sense of privacy to the small space. 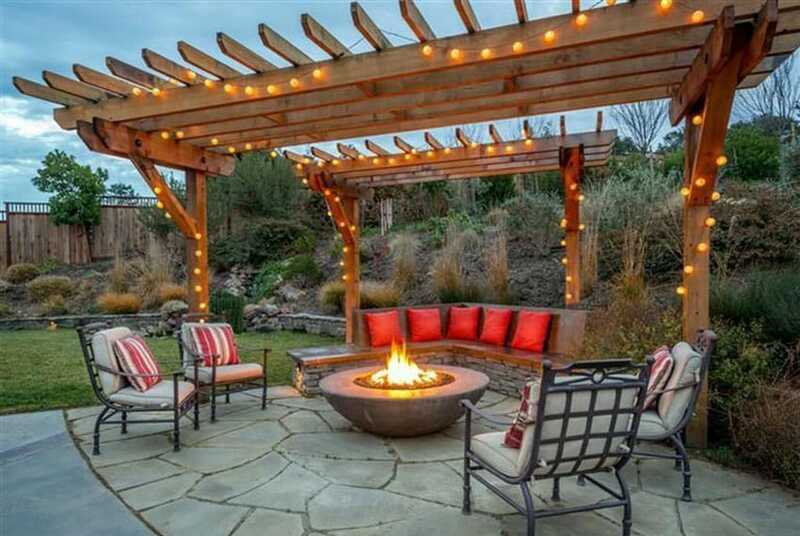 Placed right at the outer edge of the pergola structure is a round fire pit made from concrete and stone masonry. 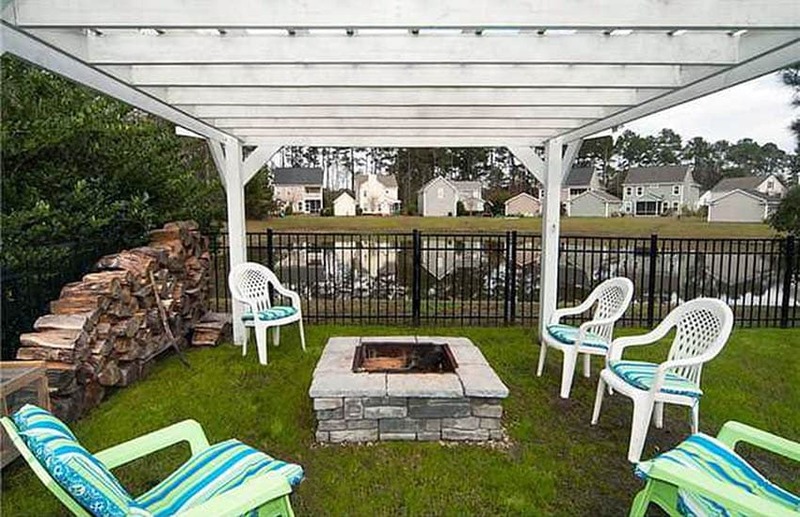 Since this pergola is placed on the lawn, it is fairly easy to make built-in fire pits like in the photo above. The white pergola is made from metal, that is why the clearance between the fire pit surface and the overhead structure is lower than usual. The metal pergola also makes it more mobile. The unique gable shape of this wooden pergola structure makes it look like a skeletal structure of a roof. 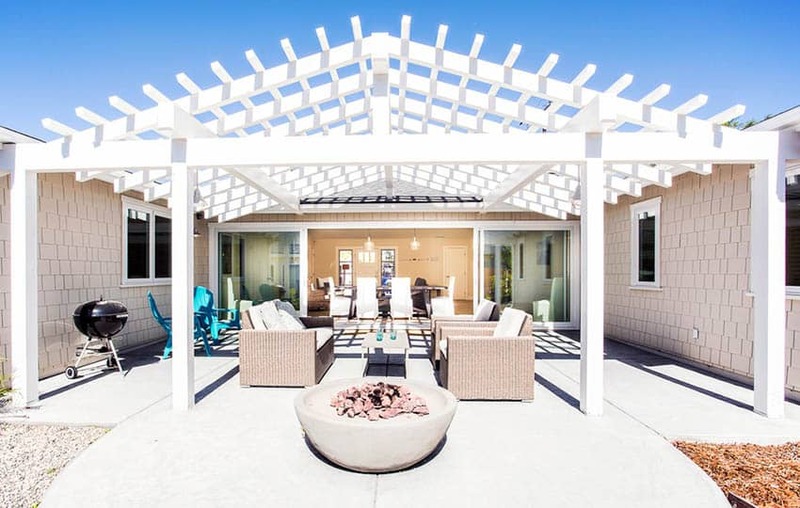 A fire pit is placed right outside the pergola structure, as the concrete bowl fire pit is a bit large and produces a larger fire, so placing it a bit away from the wooden pergola makes it safer. 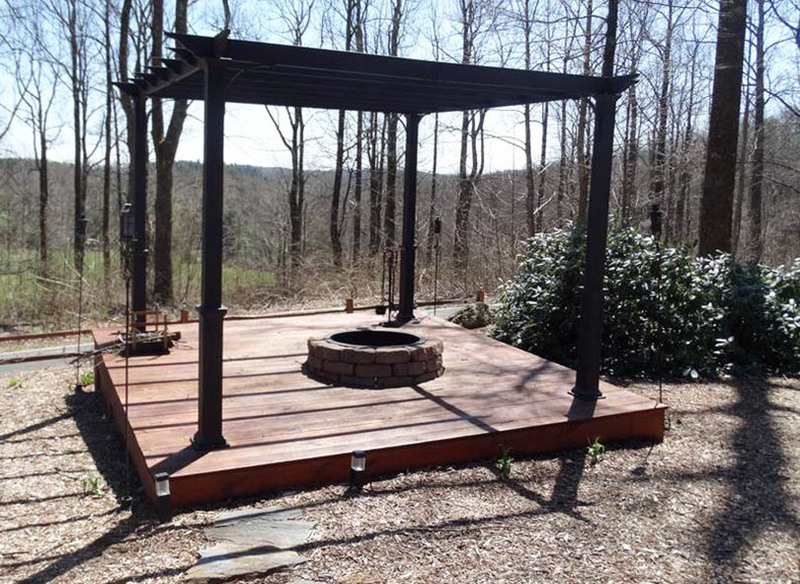 Another way to build a fire pit is to make it built-in with the pergola structure. The fire pit was built recessed on the pergola’s wooden deck and is covered by stones so that the heat doesn’t directly come in contact with the wooden deck. The recessed structure also makes the fire source lower, making it safer for overhead pergola structures. Wood fire pits typically produce bigger fires and more smoke. Because the small pergola structure is a bit low and made from wood, the fire pit was placed a bit away from the pergola for safety. This butane gas fire pit has a more modern look to match the overall aesthetic of the patio space. 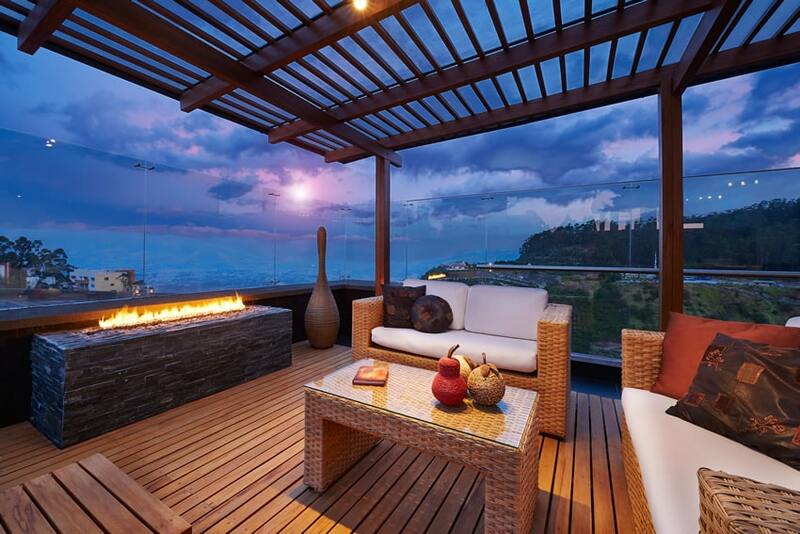 The small linear fire definitely adds a more romantic ambiance on this small outdoor lounge. This fire pit is made from a concrete structure, built into the concrete flooring of the patio. 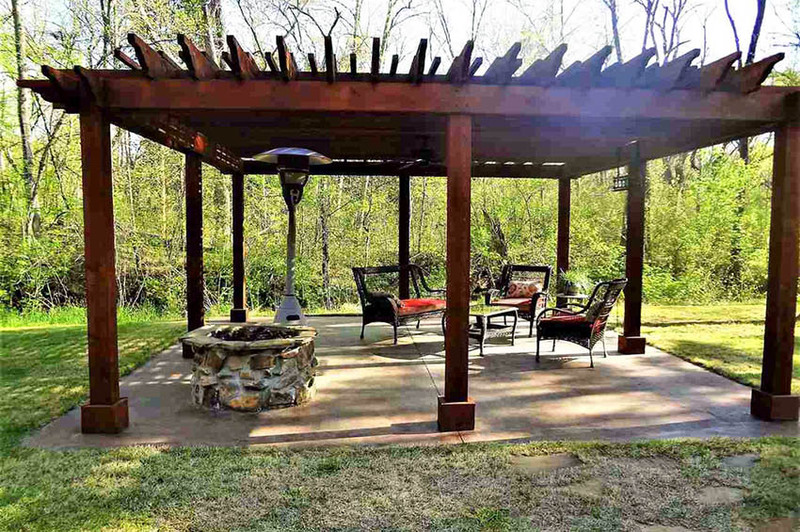 The pergola on the other hand is made from metal support columns and fire-retardant wood overhead slats, making it safe to use with a fire pit. This is a nice idea for people who have very little garden/yard space. 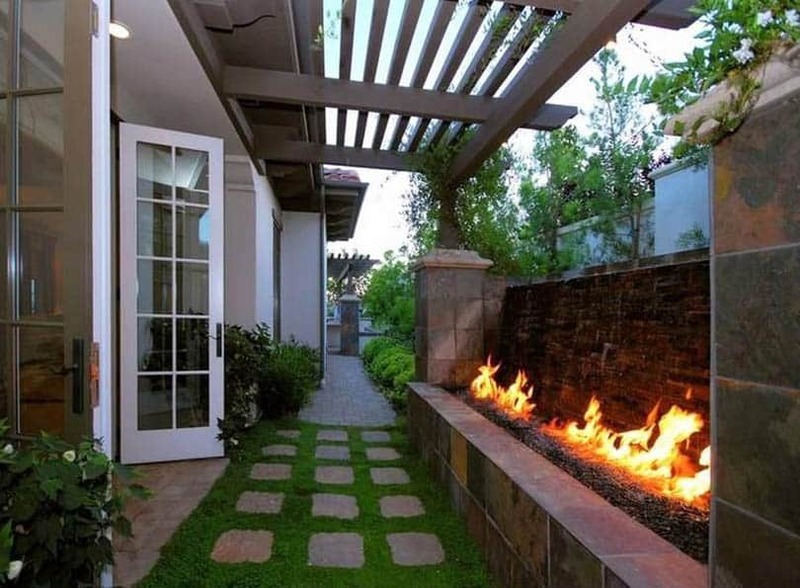 Just right outside the door, a linear LP gas fire pit is built into the concrete fence structure to set a gorgeous ambiance to the small garden. 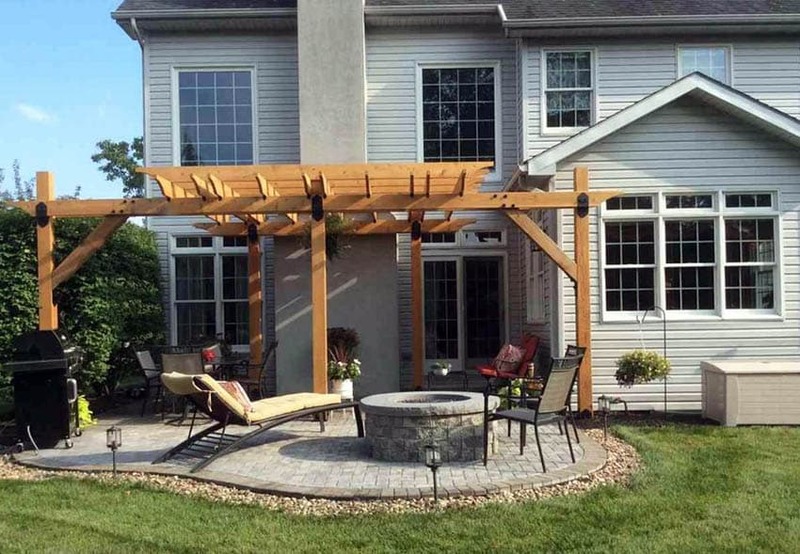 Fire treated wood was used on the overhead pergola structure to add shade and privacy to the small space. 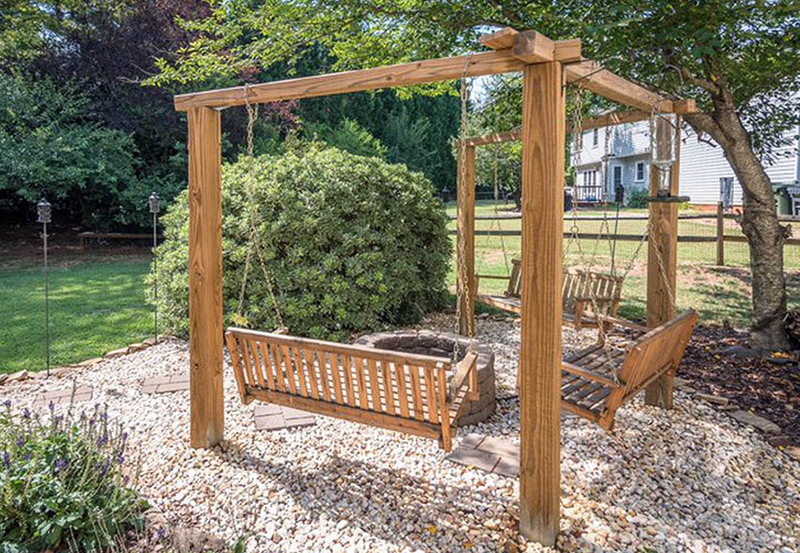 If you want a more unique feature in your yard/garden, adding a swing is a great and fun idea. To make it even better, why not add a swing right under a pergola so that it would be inviting to use even when the sun is high? This small bench swing is attached on a pergola with a concrete foundation making it very sturdy and safe. Right in front is a stone fire pit to help keep you warm on colder days or nights spent at the yard. This is a unique 3-sided swing. It is attached on solid wood posts and surrounds a small stone fire pit, making it an ideal private hang-out space when you want to relax and be one with nature. See more pergola ideas on our gallery page.